Plant cells with visible chloroplasts. The plastid (Greek: πλαστός; plastós: formed, molded – plural plastids) is a membrane-bound organelle found in the cells of plants, algae, and some other eukaryotic organisms. Plastids were discovered and named by Ernst Haeckel, but A. F. W. Schimper was the first to provide a clear definition. Plastids are the site of manufacture and storage of important chemical compounds used by the cells of autotrophic eukaryotes. 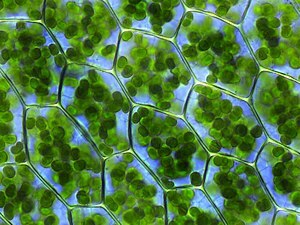 They often contain pigments used in photosynthesis, and the types of pigments in a plastid determine the cell's color. They have a common evolutionary origin and possess a double-stranded DNA molecule that is circular, like that of prokaryotic cells. Plastids that contain chlorophyll can carry out photosynthesis and are called chloroplasts. Plastids can also store products like starch and can synthesize fatty acids and terpenes, which can be used for producing energy and as raw material for the synthesis of other molecules. For example, the components of the plant cuticle and its epicuticular wax are synthesized by the epidermal cells from palmitic acid, which is synthesized in the chloroplasts of the mesophyll tissue. All plastids are derived from proplastids, which are present in the meristematic regions of the plant. Proplastids and young chloroplasts commonly divide by binary fission, but more mature chloroplasts also have this capacity. Depending on their morphology and function, plastids have the ability to differentiate, or redifferentiate, between these and other forms. Each plastid creates multiple copies of a circular 75–250 kilobase plastome. The number of genome copies per plastid is variable, ranging from more than 1000 in rapidly dividing cells, which, in general, contain few plastids, to 100 or fewer in mature cells, where plastid divisions have given rise to a large number of plastids. The plastome contains about 100 genes encoding ribosomal and transfer ribonucleic acids (rRNAs and tRNAs) as well as proteins involved in photosynthesis and plastid gene transcription and translation. However, these proteins only represent a small fraction of the total protein set-up necessary to build and maintain the structure and function of a particular type of plastid. Plant nuclear genes encode the vast majority of plastid proteins, and the expression of plastid genes and nuclear genes is tightly co-regulated to coordinate proper development of plastids in relation to cell differentiation. Plastid DNA exists as large protein-DNA complexes associated with the inner envelope membrane and called 'plastid nucleoids'. Each nucleoid particle may contain more than 10 copies of the plastid DNA. The proplastid contains a single nucleoid located in the centre of the plastid. The developing plastid has many nucleoids, localized at the periphery of the plastid, bound to the inner envelope membrane. During the development of proplastids to chloroplasts, and when plastids convert from one type to another, nucleoids change in morphology, size and location within the organelle. The remodelling of nucleoids is believed to occur by modifications to the composition and abundance of nucleoid proteins. Many plastids, particularly those responsible for photosynthesis, possess numerous internal membrane layers. In plant cells, long thin protuberances called stromules sometimes form and extend from the main plastid body into the cytosol and interconnect several plastids. Proteins, and presumably smaller molecules, can move within stromules. Most cultured cells that are relatively large compared to other plant cells have very long and abundant stromules that extend to the cell periphery. In 2014, evidence of possible plastid genome loss was found in Rafflesia lagascae, a non-photosynthetic parasitic flowering plant, and in Polytomella, a genus of non-photosynthetic green algae. Extensive searches for plastid genes in both Rafflesia and Polytomella yielded no results, however the conclusion that their plastomes are entirely missing is still controversial. Some scientists argue that plastid genome loss is unlikely since even non-photosynthetic plastids contain genes necessary to complete various biosynthetic pathways, such as heme biosynthesis. In algae, the term leucoplast is used for all unpigmented plastids. Their function differs from the leucoplasts of plants. Etioplasts, amyloplasts and chromoplasts are plant-specific and do not occur in algae. Plastids in algae and hornworts may also differ from plant plastids in that they contain pyrenoids. Glaucophyte algae contain muroplasts, which are similar to chloroplasts except that they have a peptidoglycan cell wall that is similar to that of prokaryotes. Red algae contain rhodoplasts, which are red chloroplasts that allow them to photosynthesise to a depth of up to 268 m. The chloroplasts of plants differ from the rhodoplasts of red algae in their ability to synthesize starch, which is stored in the form of granules within the plastids. In red algae, floridean starch is synthesized and stored outside the plastids in the cytosol. Most plants inherit the plastids from only one parent. In general, angiosperms inherit plastids from the female gamete, whereas many gymnosperms inherit plastids from the male pollen. Algae also inherit plastids from only one parent. The plastid DNA of the other parent is, thus, completely lost. In normal intraspecific crossings (resulting in normal hybrids of one species), the inheritance of plastid DNA appears to be quite strictly 100% uniparental. In interspecific hybridisations, however, the inheritance of plastids appears to be more erratic. Although plastids inherit mainly maternally in interspecific hybridisations, there are many reports of hybrids of flowering plants that contain plastids of the father. Approximately 20% of angiosperms, including alfalfa (Medicago sativa), normally show biparental inheritance of plastids. Plastid DNA of maize seedlings is subject to increased damage as the seedlings develop. The DNA is damaged in oxidative environments created by photo-oxidative reactions and photosynthetic/respiratory electron transfer. Some DNA molecules are repaired while DNA with unrepaired damage appears to be degraded to non-functional fragments. DNA repair proteins are encoded by the cell’s nuclear genome but can be translocated to plastids where they maintain genome stability/integrity by repairing the plastid’s DNA. As an example, in chloroplasts of the moss Physcomitrella patens, a protein employed in DNA mismatch repair (Msh1) interacts with proteins employed in recombinational repair (RecA and RecG) to maintain plastid genome stability. Plastids are thought to have originated from endosymbiotic cyanobacteria. This symbiosis evolved around 1.5 billion years ago and enabled eukaryotes to carry out oxygenic photosynthesis. Three evolutionary lineages have since emerged in which the plastids are named differently: chloroplasts in green algae and plants, rhodoplasts in red algae and muroplasts in the glaucophytes. The plastids differ both in their pigmentation and in their ultrastructure. For example, chloroplasts in plants and green algae have lost all phycobilisomes, the light harvesting complexes found in cyanobacteria, red algae and glaucophytes, but instead contain stroma and grana thylakoids. The glaucocystophycean plastid—in contrast to chloroplasts and rhodoplasts—is still surrounded by the remains of the cyanobacterial cell wall. All these primary plastids are surrounded by two membranes. Complex plastids start by secondary endosymbiosis (where a eukaryotic organism engulfs another eukaryotic organism that contains a primary plastid resulting in its endosymbiotic fixation), when a eukaryote engulfs a red or green alga and retains the algal plastid, which is typically surrounded by more than two membranes. In some cases these plastids may be reduced in their metabolic and/or photosynthetic capacity. Algae with complex plastids derived by secondary endosymbiosis of a red alga include the heterokonts, haptophytes, cryptomonads, and most dinoflagellates (= rhodoplasts). Those that endosymbiosed a green alga include the euglenids and chlorarachniophytes (= chloroplasts). The Apicomplexa, a phylum of obligate parasitic protozoa including the causative agents of malaria (Plasmodium spp. ), toxoplasmosis (Toxoplasma gondii), and many other human or animal diseases also harbor a complex plastid (although this organelle has been lost in some apicomplexans, such as Cryptosporidium parvum, which causes cryptosporidiosis). The 'apicoplast' is no longer capable of photosynthesis, but is an essential organelle, and a promising target for antiparasitic drug development. Some dinoflagellates and sea slugs, in particular of the genus Elysia, take up algae as food and keep the plastid of the digested alga to profit from the photosynthesis; after a while, the plastids are also digested. This process is known as kleptoplasty, from the Greek, kleptes, thief. ^ Sato, N. (2006). "Origin and Evolution of Plastids: Genomic View on the Unification and Diversity of Plastids". In R.R. Wise; J.K. Hoober. The Structure and Function of Plastids. Advances in Photosynthesis and Respiration. 23. Springer Netherlands. pp. 75–102. doi:10.1007/978-1-4020-4061-0_4. ISBN 978-1-4020-4060-3. ^ a b Wise, Robert R. (2006). "1. The Diversity of Plastid Form and Function" (PDF). Advances in Photosynthesis and Respiration. 23. Springer. pp. 3–26. doi:10.1007/978-1-4020-4061-0_1. ISBN 978-1-4020-4060-3. ^ a b "Plants Without Plastid Genomes". The Scientist. Retrieved 2015-09-26. ^ Barbrook, Adrian C.; Howe, Christopher J.; Purton, Saul (2006). "Why are plastid genomes retained in non-photosynthetic organisms?". Trends in Plant Science. 11 (2): 101–108. doi:10.1016/j.tplants.2005.12.004. PMID 16406301. ^ Viola, R.; Nyvall, P.; Pedersén, M. (2001). "The unique features of starch metabolism in red algae". Proceedings of the Royal Society of London B. 268 (1474): 1417–1422. doi:10.1098/rspb.2001.1644. PMC 1088757. PMID 11429143. ^ Zhang, Q.; Sodmergen (2010). "Why does biparental plastid inheritance revive in angiosperms?". Journal of Plant Research. 123 (2): 201–206. doi:10.1007/s10265-009-0291-z. PMID 20052516. ^ Kumar RA, Oldenburg DJ, Bendich AJ (December 2014). "Changes in DNA damage, molecular integrity, and copy number for plastid DNA and mitochondrial DNA during maize development". J. Exp. Bot. 65 (22): 6425–39. doi:10.1093/jxb/eru359. PMC 4246179. PMID 25261192. ^ Oldenburg DJ, Bendich AJ (2015). "DNA maintenance in plastids and mitochondria of plants". Front Plant Sci. 6: 883. doi:10.3389/fpls.2015.00883. PMC 4624840. PMID 26579143. ^ Odahara M, Kishita Y, Sekine Y (August 2017). "MSH1 maintains organelle genome stability and genetically interacts with RECA and RECG in the moss Physcomitrella patens". Plant J. 91 (3): 455–465. doi:10.1111/tpj.13573. PMID 28407383. ^ Ochoa De Alda, Jesús A. G.; Esteban, Rocío; Diago, María Luz; Houmard, Jean (2014). "The plastid ancestor originated among one of the major cyanobacterial lineages". Nature Communications. 5: 4937. Bibcode:2014NatCo...5E4937O. doi:10.1038/ncomms5937. PMID 25222494. ^ Hedges SB, Blair JE, Venturi ML, Shoe JL (January 2004). "A molecular timescale of eukaryote evolution and the rise of complex multicellular life". BMC Evol. Biol. 4: 2. doi:10.1186/1471-2148-4-2. PMC 341452. PMID 15005799. ^ Chan, C. X. & Bhattachary, D. (2010). "The Origin of Plastids". Nature Education. 3 (9): 84. A Novel View of Chloroplast Structure: contains fluorescence images of chloroplasts and stromules as well as an easy to read chapter. Wycliffe P, Sitbon F, Wernersson J, Ezcurra I, Ellerström M, Rask L (October 2005). "Continuous expression in tobacco leaves of a Brassica napus PEND homologue blocks differentiation of plastids and development of palisade cells". Plant J. 44 (1): 1–15. doi:10.1111/j.1365-313X.2005.02482.x. PMID 16167891. Chan CX, Bhattacharya D (2010). "The origins of plastids". Nature Education. 3 (9): 84. Bhattacharya, D., ed. (1997). Origins of Algae and their Plastids. New York: Springer-Verlag/Wein. ISBN 978-3-211-83036-9. Gould SB, Waller RR, McFadden GI (2008). Plastid evolution. Annu Rev Plant Biol 59: 491–517.